Helping others doesn’t always have to mean grand gestures. It can be about the little things that we do on a more regular basis to help make a difference. If you know people who you think would make great friends, introduce them to each other. Visit your local senior centers & ask how you can help – even if it simply spending time with the people there & listening to their stories. Put together care kits for the homeless. Send a card to a hospitalized child through a site like cardsforhospitalizedkids.com. Have people donate to a charity instead of giving you birthday gifts. 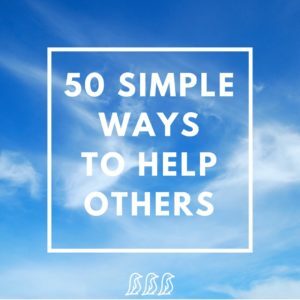 Help others find the resources that they need. There are so many helpful community organizations & sometimes all someone needs is that initial connection. Donate food regularly to local community organizations in need. Check with them to make sure you follow their guidelines. Participate in local government & community groups. Lend your voice & speak up for the greater good of the community. Be kind to everyone that you interact with throughout the day (even if they are not kind to you). Give thoughtful gifts that show your friends & family that you truly understand them as a person. Educate yourself & utilize green strategies when you can. Plan social activities for friends & acquaintances to encourage community bonds. Donate clothes to a homeless shelter. Pay for the food, coffee, or bus fare for the person behind you in line. Send a quick text of encouragement to a friend before a big interview, meeting, project, etc. Help out fellow parents by offering to babysit – even if it’s just for an hour or two. Compliment fellow parents when you see them out & about doing a good job parenting their children. Do a household chore that is usually your partner’s responsibility. Take the time to actually fill out those customer service surveys & give your server, attendant, etc a rave review. Take a step back when you are getting annoyed with others & remind yourself that they might just be having a really bad day. Actually spend the few dollars to purchase something from local children’s fundraisers. Offer help when you see someone struggling to load groceries into their car. Compliment a coworker in front of others when they go above & beyond. Patiently help a friend slowly & systematically work through a hard decision. Keep your eyes and ears open for job openings & pass them along to others who might be a good fit. Introduce yourself to your neighbors & people you come across regularly in the community. Pack extra snacks & offer them to those around you whether you’re at work or at the park. Volunteer at school events when asked. Donate some of your time to a local community organization to help teach a skill that comes naturally to you (photography, cooking, computer skills, etc). Stand up for someone who is being treated unfairly. Stop complaining about things that aren’t a big deal. Letting it go will also help those around you. Ask local organizations about volunteer opportunities. Make birthdays a big deal & go out of your way to make the person feel special. Cover co-worker’s shifts when they have something important that they need to take off for. Organize a meal train for someone in need. Go to your friend’s kid’s events & activities to show your support. Encourage those around you to learn new skills & support their passions. Send a care package to someone far from home. Help a tourist find fun activities to do in your town. When someone has a significant impact on your life, reach out to let them know. Reach out to old friends when you think of them – even if it’s been years. Add coins to someone’s parking meter if you notice that it’s about to run out. Collect winter coats from the people in your community & donate them to charity. Make the effort to spend time with friends. Add it to the calendar & make it happen. Become a mentor through a local youth organization. Care for yourself. You will be better able to help others when your own needs are fulfilled.